In a panel interview earlier today at the Code/Mobile conference, BlackBerry CEO John Chen made some rather interesting affirmations regarding the company's future. Chen said that BlackBerry's goal is to sell five million smartphones per year, a threshold that would allow its handset division to reach profitability. Obviously, the upcoming BlackBerry Priv, the company's first Android smartphone, is the device that's expected to carry most of the weight. Based on BlackBerry's most recent earnings report, which confirmed that the company only managed to sell 800,000 phones in the second quarter of the financial year, it looks like BlackBerry has high hopes from the Priv. If the company doesn't meet this goal, Chen said that it wouldn't be unthinkable for BlackBerry to exit the smartphone market. In other words, if the BlackBerry Priv turns out to be unsuccessful, then it could well be the last BlackBerry smartphone ever. If that turns out to be the case, then BlackBerry could move on to focus on its business as a provider of security technology for other platforms, such as Apple's iOS or Google's Android. Speaking of the BlackBerry Priv, the handset will run Android, but the iconic smartphone maker will also bake in some of its security technology. Interestingly, John Chen also mentioned that his company's mobile security technology matches Samsung's Knox in terms of features. However, the BlackBerry CEO believes that the Priv will outpace other devices when it comes to battery life, antennas, and text input (thanks to the phone's slide-out physical keyboard). Although it might seem like the BlackBerry Priv is aimed at enterprise users due to its security features, Chen said that this is not the case. Instead, the BlackBerry Priv will be a product that aims for the high-end sector of the smartphone market. The BlackBerry CEO also said that you'll be able to buy the Priv directly from all four major carriers in the US. Chen's comments on the future of the BlackBerry smartphone business come just a few days after the Sony CEO announced that his company might stop making smartphones if 2016 doesn't mark a comeback to profit for Sony's smartphone division. That's an odd coincidence, don't you think? And it still would have been better than anything krapple ever put on the market hahah! The Death of Blackberry by Mxyzptlk. Look for my Pulitzer prize. they should exit. Sony, HTC and black berry should exit smart phone business if they cannot make attractive devices to attract customers. Why keep on lingering when they are continously failing? Atleast, Sony should focus more on its imaging business. Sony is doing good break throughs in sensors, so why not focus all the reasorses and energy to take more profit from image business? Honestly they could sell alot, but so many people will associate the blackberry name as old. They should join Microsoft to take that chunky fat green robot down always eating snacks like marshmallows and lollipops. Windows for life the messiah has spoken. DOA. Great way to show weakness BB. Good luck. He has been saying that for a year now and nothing. http://www.techweekeurope.co.uk/workspace/blackberry-smartphones-exit-john-chen-143562 And he said rethink which could mean a lot of stuff... Verge is known for yellow journalism. "Chen is adamant that BlackBerry could return to profitability by the end of March 2016, and said that the firm was “ahead of schedule” despite losing £3.5 billion during the previous financial year. However he freely admitted that time was not on his side and that it was necessary to have a short term plan to keep the company afloat while also planning for the future." Here he doesnt say anything about dropping phones but rather trying to gain profit in next years. In both interviews he doesnt claim to drop phones if profits get lower. Altough it might happen, it obviously isnt now or next year. They have also other incomes. How is that obvious? I'm not saying he will leave the business, nor am I saying he won't (only John and possibly a few in his inner-circle know that for sure), but a statement like "if unsuccessful, the Blackberry Priv might be the last BlackBerry smartphone ever" is a totally justified hypothesis. Yeah, the Verge is biased (which they even recently admitted to), but this is a fairly conservative way to read John's statement; It only makes sense to exit a market you have no chance of being profitable in, and some would argue they should have left the handset business years ago. 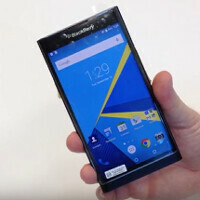 It is obvious cause they wouldnt made Priv in the first place and update BB for the next year: http://www.phonearena.com/news/BlackBerry-10.3.3-now-scheduled-for-a-March-arrival_id74095 Spend $425 million on mobile security:http://www.phonearena.com/news/BlackBerry-spends-425-million-to-acquire-mobile-security-firm-Good-Technology_id73421 I highly doubt that if he wanted to close BB devices off he wouldnt do all of that. It isnt justified really when it can means a lot of things but clickbaits creat most views and discussions just like me and you now :D I agree but would you start making a phone that you arent sure if it would sell well or not? I know that it could mean an act of trying to make profits but if you already said last year that you will be "possibly" quitting you wouldnt try to spend more on making a totally new phone. He knows more than us hence why he wouldnt quit in the near future. Just my opinion. Fair enough, I just hope whatever decision Chen makes ends up making the company stronger. They have too much to offer to potentially squander it. If that means swallowing their pride and exiting the handset industry, so be it. I do think 5 million devices is attainable, but we'll see. Agreed. The Verge is definitely known for such. Although I do believe that what the BlackBerry Priv is bringing to Android will help it differentiate enough from other Android handsets and sell well, I know that if it doesn't sell well, Chen will exit the hardware business, perhaps only offering updates to existing BlackBerry handsets. It would be a sad day indeed if this legend were to exit the hardware business, but Chen is not "married" to handsets, and he must do what is necessary for the company to be profitable and thrive. But I believe the Priv will be the handset that revives BlackBery's handset sales. Be a sad day in Waterloo if they stop selling handsets. Personally I'd like to see what a Passport 2 would be like. Agreed. I'd like to see a Passport 2 looking similar to the Classic, but with the size of the Passport. Or perhaps a Classic 2 with high end specs like the Passport and a bigger size. I'd also like to see an all-touch variant of the Passport or a Z30 part 2 with updated specs, just to quell the thirst of those wanting an all-touch BB10 device with updated specs. Man, I'd love to see an updated BB Classic. With BB10 of course. Agreed! That would be one sweet handset! Come on people. Bring out your wallets and save BlackBerry! I think that no one is standing out that much out of the android OEMs because most of these devices these days perform greatly. I don't think they'll make it in the saturated space. There's not that much money to be made on the high end. "Sometime next year we have to make our device business profitable, otherwise I have to rethink what I do there." -John Chen Nice to focus on the negative! Anything that Chen says needs to be turned negative. Why don't we focus on all the positive things that he said. We need to focus on one negative thing he said, and twist it to make it even sound even more negative. I'm an unabashed webOS devotee and it was sad to see the Godfather of smartphones perish. Now it seems Palm's highest ranking Capo may suffer the same fate. Not because of garbage handsets or a garbage OS, but because of a totally uninformed buying public. Yes, BB had their Storm debacle, but for every Storm there were 20 Cliqs, Status and Charms to lay Android eggs. I love technology and I browse a dozen of these sites every day, I don't see many articles about Blackberry, noone is really promoting them. They only became interesting recently because of their Android-based phone. Otherwise it's just been articles about bad sales or how "safe" their OS is. because the priv has android, while the new lumias have windows and nobody cares about windows anymore. They might exit for a couple of years, then return again. oh well..